When looking into a senior living or assisted living community, one of the most common concerns is safety. The residents and their families want to make certain that the community is not only comfortable but that it’s a safe living environment. At Warner Design Associates, we help ensure that the design of the community is built with safety in mind so that the residents and their loved ones can rest assured. Here are 5 tips to create a safer senior living environment. Having a walkable community is not only important to a resident’s physical health, but it can also support one’s mental health by promoting independence and interaction with other residents. However, mobility in a senior living center can also be a major cause for concern. We want to ensure that residents can safely get from one room to the next without qualms for getting lost, slipping, or being left in the dark. At Warner Design Associates, we recommend setting up handrails, sitting areas, and avoiding any dead ends to create safe, walkable environments. Handrails should be securely placed on both sides of a hallway to support residents that need assistance walking between rooms. Sitting areas are also recommended so that residents can take a break if they get tired or need to rest when moving throughout the community, and avoiding dead ends can help reduce stress triggers for patients with dementia in case they get lost. While handrails are often placed throughout walkways, furniture is also commonly used to support seniors in their everyday movements. That’s why it’s important to select high quality, durable furniture with armrests to provide assistance for seniors when standing up, sitting down, or walking between rooms. Understanding health compliance for furniture material is also important as there are strict healthcare laws in place to prevent hospital-acquired infections. Learn more about how to select the right furniture for your senior living community. 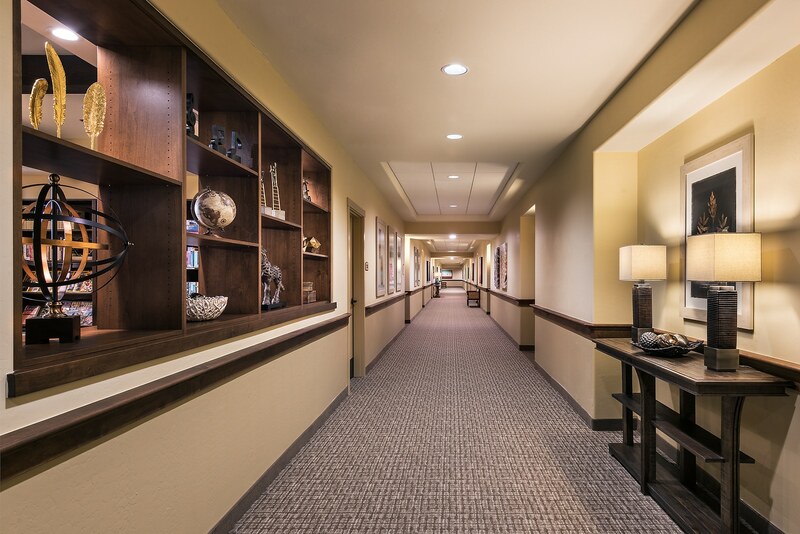 Lighting and color are very important design elements in any senior living community because as seniors age, the eyes harden and become more yellow. This can make it difficult to distinguish certain colors and see in dark lighting. We often recommend choosing saturated, contrasting colors rather than greys or pastels since they are easier to recognize with age. Making sure that common areas, hallways and dining rooms are well lit can also significantly reduce the risk of someone falling or tripping while moving throughout the community. Technology can not only be used to help residents connect with their families and stay up to date on the rest of the world, but it can also be integrated into the community design to promote a safer living environment. For example, keyless entries can help residents safely enter their rooms in the event that they misplaced their keys. Call buttons placed next to one’s bed or in one’s shower can also help residents get help faster in the event of an emergency. In a senior living environment, it’s important to consider how the layout of the community can affect the response time from staff members. We suggest reducing the walking distances between rooms and clinical spaces. This will help caregivers reach residents faster if there were to be an accident or emergency. The goal is to lay out the community in a way that makes it easy for caregivers to find patients and provide proper, effective treatment. If you have any questions about how to promote a safer senior living environment or things your community can do to increase safety, please don’t hesitate to contact us with any questions.